It had been a year since his last Congress, and in that time something new, something truly groundbreaking had occurred. Because when Mr. Hubbard announced, “You have a new horizon, a new future,” he was in fact referring to the development of modern auditing leading to the Grade Chart itself. For just as he’d revolutionized auditor training with Training Drills (TRs), he’d now developed a brand-new meter and codified its use in auditing. And even all of that was only a part of something far greater he’d begun: The Saint Hill Special Briefing Course! Then again, he left no doubt this would be a new type of Congress as well: “I’m not going to pull any punches for you at all.” And he didn’t. For here is where he announced his discovery of the Goals Problem Mass (GPM), “Masses of mental energy, you might say, burned down to the last notch, and nobody can get rid of the cinders.” And that’s just the beginning of what he reveals regarding the GPM—extending back 200 trillion years—in these, the only public lectures ever given on the subject outside the Briefing Course. Moreover, there’s what that discovery revealed in terms of case progress at every level. In fact, as L. Ron Hubbard also reveals, it had everything to do with the development of the E-Meter. In a single word—the subject is Withholds. And when you find out what they do to your bank, how they affect your reach, indeed, your very beingness—you’ll think twice before ever sitting on one. You will also understand why this is the Clean Hands Congress and the route upwards and onwards to freedom. The road to Hell—Man’s very good at painting ugly signs that point its course and way. But now a road that’s wide has opened up—in Scientology. The meter and the Process Check, when done by auditors with skill, can open up transgression’s rush and loose a cascade out until Hell’s spent. 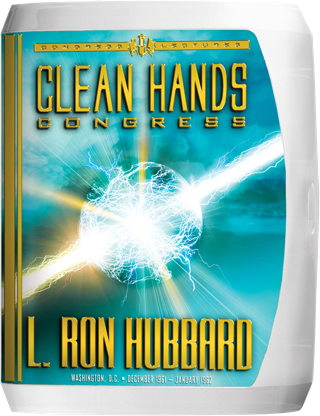 “Clean Hands Make a Happy Life,” wrote Mr. Hubbard in the autumn of 1961. And, as attendees would soon learn, what made those hands clean was the E‑Meter. The story had actually begun seven months earlier—the 7th of May, 1961, to be precise. It was a day that would forever change the face of Scientology, from the very manner in which auditors were trained, to the conduct of an auditing session and the structure of the Bridge itself. For it was the day the Saint Hill Special Briefing Course (SHSBC) commenced. As for what else that discovery encompassed, the definition, anatomy and construction of the Goals Problem Mass (GPM) is contained here, in the only public lecture on the subject ever given outside the SHSBC. And therein lay the substance of this Congress. For while the discovery of the GPM would occupy continuing years of research—leading to the development of the Clearing Course—what it, in turn, revealed was something that impacted every level of processing and training of auditors: Withholds. “It has nothing to do with morals. “It has everything to do with upward and onward and freedom.